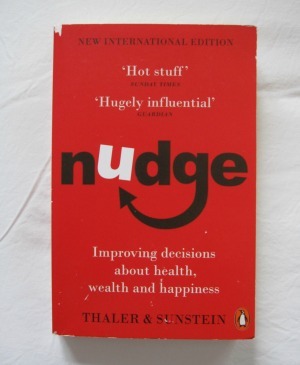 I had heard a little bit about how you can use nudges to help people make better choices so I was interested to read Thaler & Sunstein’s Nudge. It is an interesting read which went into lots of detail about how nudges work and how designers can use them to our advantage. Of course you cannot have a conversation about something like this without looking at the ethics too which I felt was an important part of the book - who should create nudges; can they be taken too far; how transparent about what we are doing do we need to be? The basic premise of the book is that humans are really bad at making good choices, especially when they are complicated things which we do not do very often, for instance picking a mortgage. The authors of the book suggest that this is the perfect time to use nudges to help us make the best choice possible. They also went into a lot of detail about what a nudge might look like. For instance it could be as simple as the placement of different food types in the school canteen based on our knowledge of how foods are selected, or by using an opt-out where someone is automatically opted in for something like being an organ donor, unless they tick a box opting out. It is surprising how these small nudges can have a massive impact. These nudges still leave us with freedom of choice, but help us to make better decisions in the long run. I found this an interesting and well written book, but be ready to find out a lot more about the American mortgage, healthcare and pension systems than you maybe actually need or want to know.